Incorporated in May 1977, Church-Isabella Residents Co-operative is a not-for-profit housing provider located in the center of downtown Toronto near the Yonge and Bloor Street intersection. 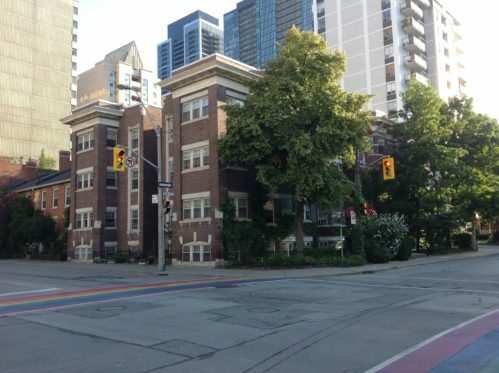 It has three buildings at two sites: 72 Isabella Street with 18 apartment units in a three story walk-up (occupied July 1980); 589 – 595 Church Street with 12 units in 6 stacked town homes (occupied July 1981); and 56 Wellesley Street East with 18 apartment units in a complex building form which looks like a four storey apartment building (occupied Aug. 1985). It is staffed by a part-time bookkeeper and part-time coordinator and mostly is managed and operated by member volunteers. Only the 56 Wellesley East units are still covered by a CMHC agreement which requires that 25% of the units be rent geared to income. The cable is included.